Area : 2026 sq. km. It is situated at a distance of 145 km from Kohima. Here some of the most colourful species of Orchid are found. 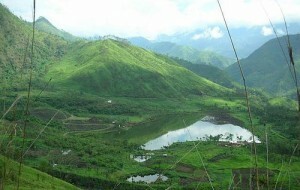 This area is the habitat of the world famous Blythe’s Tragopan, a pheasant of Nagaland. Chakhesang culture and costumes are quite different from the other Naga tribes. The stones and pillars near Chesezumi village on the Chazouda Road dear testimony to the existent of headhunting among the villager in the ancient days. Pfutsero: It is situated at an altitude of 2133 mts. above sea level. This beautiful township is the oldest town in Nagaland. Apples are grown here. It is connected with Kohima by a 70 km border road. Nagaland Stated Transport Buses ply on this road regularly. There is a wayside amenity at Chazouba. Khezakenoma Village: This village is believed to be the originating place of many of the southern Naga tribes from where further migration into the wild had begun. Legends of old, speaks of a slab of stone in this village was supposed to multiply paddy when spread over it for drying. This stone is still preserved. One can reach this village from Tabubi in Manipur or Psuthero in Phek district. Shilloi Lake: This Lake lies on the lower slopes of the hill ranges running along the Mynmar border in the Phek district to Nagaland. Spread over 0.25 to 0.30 sq. km., the lake has the shape of a footprint. The average depth of the lake is likely to be 4 mts. The water is dark grey, perhaps because of the large amount of silk adding to the mystery. Shilloi is about 300 km from Kohima and can be assesses by jeep, bus, truck etc. This entry was posted in Nagaland, Phek and tagged about phek, Khezakenoma Village, Pfutsero, phek map, Shilloi Lake. Bookmark the permalink.